What can virtual collaboration do for you? Improve your team's sales performance. Enable you to give ad hoc demos and instantly conduct team meetings. Establish and grow relationships. And that's just for starters. 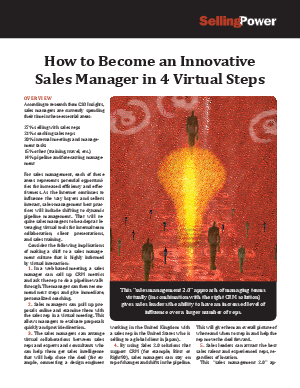 This SellingPower white paper explores four strategic ways sales managers can win by leveraging virtual tools for internal team collaboration, client presentations, training and more.